As you all know, this blog is not supportive of the established Churches (nor indeed of most religious institutions). Indeed, that is one of the few points where I would assume Jim, Tami and myself to be unanimous. However it’s equally the case that none of us has ever simply endorsed the notion that “my enemy’s enemy is my friend”. Ergo, I simply cannot help but link to a post which I noticed earlier today, by one of my own sparring partners on the abortion issue, Red Maria. She appears to have acquired from one source or another (whether over wine at a bar or at Communion I couldn’t say) a proposal from the office of Mary Honeyball MEP, a member of the European Parliament Women’s Right’s Committee, for an opinion piece on the Catholic Church’s role in UK politics. It was sent to the editors of “prominent political publications”. It is, quite simply, one of the most astounding pieces of conspiracist paranoia that I’ve seen from a mainstream politician in all my time as an afficionado of these things. Have a look at Maria’s post and judge for yourselves. Eg. Church has massive army dedicated volunteers who will blog, amend top google searches for abortion to only pro-life sites by their nature hummanists/non-religious people not as co-ordinated or spurred on to act. Still don’t get why Honeyball’s article is so bad? OK, replace “Catholic Church” with “Jews” or “Muslims”. Feeling the bile rising now, in that vomit-belch way? You betcha, baby. I’ll never support the stances of Catholic MPs who vote for laws which force the entire country in the direction of adhering to their own personal belief systems. But then I’d take the same attitude towards anyone of any religion, because I don’t believe in religious control of the state. That having been said, I also believe in freedom of religious belief and practice under secular law, and the notion of a Catholic conspiracy is as offensive as it is ludicrous. Mary Honeyball MEP, please accept the Shiraz Socialist Order of the Tinfoil Hat. Congratulations! Feminist Fightback Conference – This Saturday! unwaged and £3+ waged is encouraged. Abortion Rights is determined that all anti-abortion amendments moved as part of the Human Fertilisation and Embryology Bill currently in Parliament are defeated, and that any opportunity to advance the abortion law for women is maximised.In opposition to the pro-choice agenda, Ann Widdecombe MP, Lord David Alton and others are speaking at a national road show ‘Not on your life… or anyone else’s’ organised by Care, Life, and Right to Life Trust to drum up anti-abortion lobbying around the Bill. Abortion Rights has called peaceful pro-choice protests against the tour and as a proud public reminder that those who support a woman’s right to choose are in the overwhelming majority. Nearest tubes Westminster or St James’s Park. The Hall is on Victoria Street in London, just off Parliament Square, next to the Queen Elizabeth II Conference Centre and facing Westminster Abbey. Last night, nearly 300 women and some men gathered in committee room 14 (and the neighbouring room for the overflow) to show their support for the upcoming battle in parliament for a woman’s right to choose. It really was inspiring to see so many women, and so many young women in particular, ready to stand up to those who would take us backward. The three main parties spoke from the platform with female representatives from the Labour Party and Liberal Democrats and a male representative from the Conservatives. Many issues were discussed including precisely how we got to the point where Conservative Baroness Masham has used the unrelated Human Fertilisation and Embryology Bill to attempt to tack on an amendment restricting a women’s right to choose. 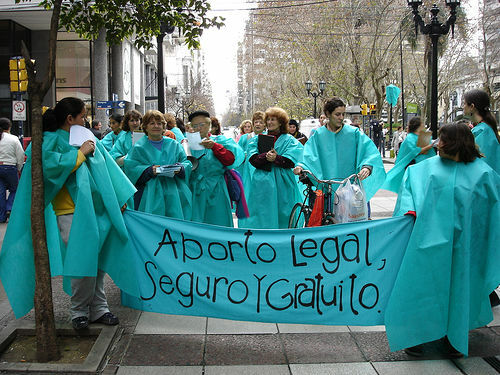 In particular they are attempting to restrict abortion in the cases of “foetal abnormality”. Many in the pro-life, anti-woman movement claim to be speaking on behalf of disabled people. However, a rousing speech was given by Alex Kent from the NUS Disabled Students in defence of a woman’s right to choose and with a certain amount of indignation at those who would use disabled people as an excuse to restrict abortion access. Baroness Jenny Tonge (LD) spoke of how this restriction would require women who were carrying foetuses with no brain to full term and this was a condition she had witnessed herself as a medical professional. There were a number of mentions made of the statistics such as those showing an 83% support amongst the British public for a woman’s right to choose and this led to references to “the silent pro-choice majority”. In addition, MP Evan Harris (LD) spoke about the scientific report which was produced in October of last year and overwhelmingly passed by a majority of MPs which concluded that there is no evidence to change the 24 week time limit and in fact further restrictions to access, like the requirement of obtaining two doctor’s signatures, should be scrapped. Emily Thornberry MP (LP) who was sponsoring the meeting ran through a list of private member’s bills which have been presented but which have all, fortunately, failed. These included the proposal to have a “cooling off period” before the woman could proceed with an abortion, forced informing of parents for teenage women under a certain age, and a combination of the lowering of the time limits coupled with a cooling off period. By far the most rousing speech of the evening was by Diane Abbott MP (LP). Diane wondered if this new fight around a women’s right to choose would involve MPs receiving plastic foetuses in the mail as they did in the 1990s when the issue was being debated. She then went on to utterly condemn those who claim that being opposed to abortion has to do with the right of children. “Where is this support once the child is born?” Abbott asked. She noted the hypocrisy, particularly concerning asylum seeker children and to much applause stated “This is an anti-woman campaign!” In addition, Diane was one of the few speakers to mention that there remained a fear of women’s sexuality which was woven into this debate. Finally she claimed, to more applause, that if these campaigners were so concerned about abortion rates, why did they also oppose sexual education? Other speakers included representatives of the Fawcett Society, the Voice for Choice Network and Doctors for a Woman’s Choice. Each added their own unique perspective to the debate and educated all in attendance. There was a discussion period afterward in which we heard from the Green Party, various NUS representatives and a very good showing from trade union activists. By the time one left there was a feeling of a new movement being born. Having said this, there will obviously be struggles ahead. I would be remiss if I didn’t mention that it is a tragedy, and nothing less, that George Galloway will not participate in this movement nor speak out in favour of a woman’s right to choose. While there was a comrade there from the ISG (of whom I continue to have a tremendous amount of love and respect for), I continue to believe that the fact that a party which claims to be to the left of Labour cannot send its only MP to such meetings a great detriment to the left. In addition, a comrade from Permanent Revolution was in attendance and was speaking to other comrades from Feminist Fightback after the meeting who were wholeheartedly in favour of direct action, demonstrations and loud protests. It is clear that others in the movement rely more on lobbying and writing to MPs. Having lived in the US and participated in clinic defence as well as pro-choice rallies in the face of very hostile and right-wing opposition, I am inclined to agree with those who want more of an emphasis on direct action to beat back the right. Baroness Joyce Gould; Baroness Jenny Tonge; Emily Thornberry MP; Katy Clark MP; Diane Abbott MP; Frances O’Grady, Deputy General Secretary TUC; Wendy Savage, Doctors for a Woman’s Choice on Abortion; Anni Marjoram, adviser to the Mayor of London; Alex Kemp, NUS Disabled Students’ Campaign; Katherine Rake, director Fawcett Society Parliamentarians opposed to women’s right to choose on abortion would like to use the government’s Human Fertilisation and Embryology Bill, currently speeding through the House of Lords, to restrict the Abortion Act. Already, Baroness Masham has tabled an amendment to restrict abortion access. Other parliamentarians are expected to try to lower the legal abortion time limit from 24 to 20 or even 13 weeks. Any such restrictions would be devastating for women and must be defeated. Pro-choice MPs are also expected to table amendments to improve the law. These should be fully supported. The room is wheelchair accessible and has a hearing loop system. Please let us know of any additional access requirements. This meeting will launch the pro-choice campaign around the Bill. Have your say and get involved – all pro-choice supporters welcome!